← Is everything a miracle? In Portland, summer is often equated by sun. Yes, when the flip-flops come out and day after day is blue skies and no rain. Usually in Portland it is a given that you begin to have that AFTER the Fourth of July, and ends sometimes around Labor Day or after. Often I think why do I live here? I love sun. But. I also love Portland. This summer, however, it has been gorgeous out, between 80-90 degrees and sun, sun, sun. When it is sunny out, everyone wants a refreshing drink. Right? We have been exploring new, refreshing recipes for the summer, especially ones that hit the spot. This one is tangy and sweet all in one glass. Preheat oven to 350 F. Toast the coconut on a baking sheet for about 6 minutes, mixing them up after 3 minutes. While the coconut is toasting, juice the limes in a blender. Put all of the used lime halves into a separate bowl along with the coconut and vanilla bean and then add the hot water. Let it soak together for about 10 minutes. Strain into the blender and add the cold water and agave nectar. Blend! Pour into a pitcher and chill in the fridge until ready to serve. 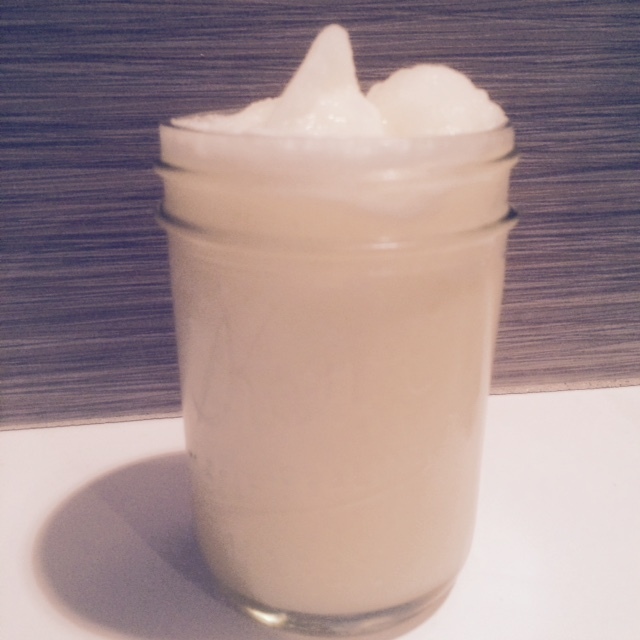 When ready, add equal parts of the limeade and ice into the blender to make your slushie! Enjoy drinking in the sun with your feet up this weekend!